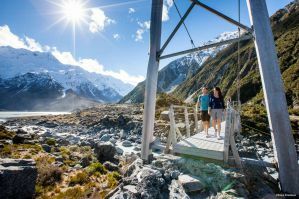 The Haka Lodge chain of hostels in New Zealand is relatively new, and aims to provide, in their own words, "an upmarket backpackers lodge, all the while costing no more than a normal hostel." As they have won numerous awards from various travel websites and companies, and received consistently great reviews from guests, so it's safe to say they are achieving that goal. In addition to "upmarket," many other similar words have described these hostels: premium, upscale, luxury, fancy, and more. The hostels were started by the Haka Tours company (based in New Zealand), and their goals are to build the best hostels in New Zealand. The results are obvious, as anyone who has stayed at one of the Haka lodges can see. The facilities and the list of amenities are top tier, while the prices are on par with other hostels. And the staff is terrific, too. First, the rooms, whether dorms or private rooms, are all decorated and appointed with the features that travelers need and want. They have plenty of power stations. They have custom-built bunk beds with lighting, plugs, curtains, and lockers. The ensuite and shared bathrooms are modern, clean, comfortable, and functional. Common rooms are also well decorated and appointed with comfortable sofas and chairs. TVs, game systems, pool tables, foosball, and other sources of entertainment can be found. The shared, communal kitchens tend to be large, modern, and stocked with multiple ovens, microwaves, stoves, and more. Long, large, and beautiful tables provide a great place to share a meal or socialize with fellow guests. The overall architecture of most of the Haka Lodges focuses on natural light from large windows, nice views, vibrant colors, and comfortable social areas. A long list of additional amenities can be found such as laundry, Wi-Fi (free in some places), breakfast and coffee (sometimes free), parking, tour booking and travel advice, bike rentals, lockers and luggage storage, and more. As a company philosophy, they want to ensure the happiness and comfort of their guests. These beliefs are not just seen in the buildings, but also in the people. The staff has a focus on making their hostels the very best that they can be. They not only keep up the place, but they also help everyone socialize with activities, provide travel advice, and ensure the safety of guests. These hostels are aimed at discerning backpackers who are looking to stay in a social environment, but not necessarily a party hostel. The Haka Lodges are comfortable and relaxing while still social and active. The rooms tend to be quiet which is exactly what guests need to sleep and rest. 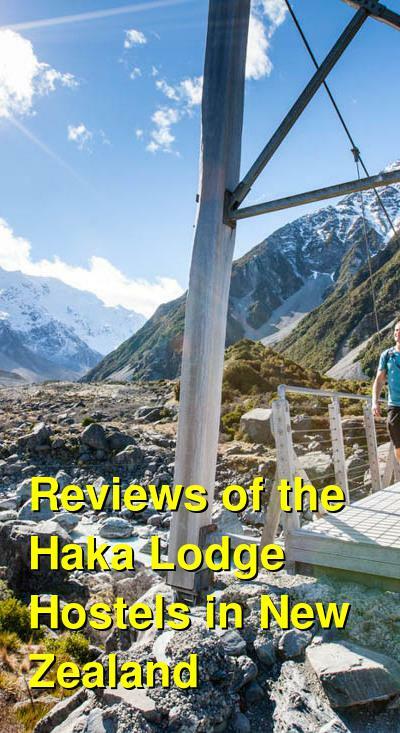 All of the Haka Lodges are highly recommended by previous guests - just check out the reviews. How much do hostels in New Zealand cost? Vibrant, colorful rooms and a sleek kitchen and common room are the highlights of this relaxing and social hostel that offers just about everything. Check out the photos! With great views, spacious common areas, an amazing kitchen, and modern facilities, you can't go wrong here! This hostel is fantastic. With a stunning kitchen, a rooftop terrace and BBQ, perfect rooms, and plenty of common space, this hostel has everything a traveler could want or need. Take a look at the photos of this hostel! With consistently amazing reviews and a full list of amenities, you can't go wrong here. The shared kitchen and common areas bring everyone together, while the bedrooms and modern, clean bathrooms help everyone relax and prepare for the next day's adventures. Comfortable dorms and private rooms, all decorated in a modern style, provide guests with a good night's sleep. The common areas are perfect for mixing with other guests, as they have comfortable sofas, TVs, and a great kitchen. The view from the outdoor deck of the surrounding mountains is great!